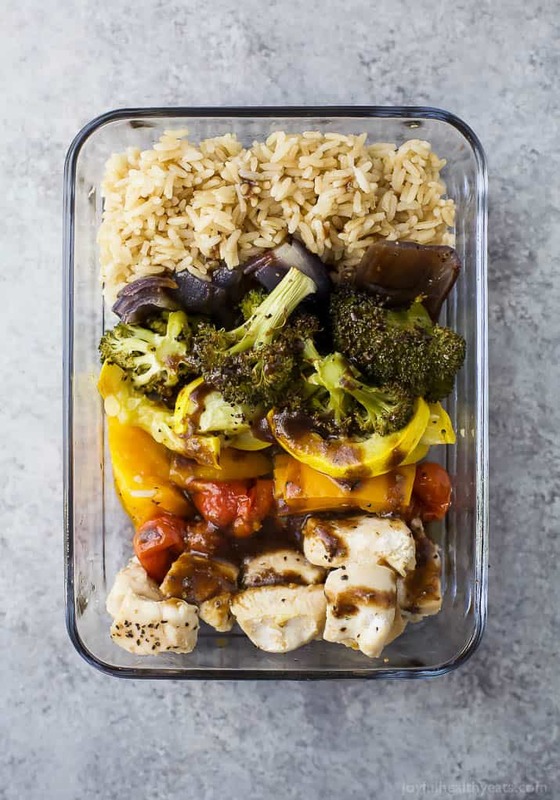 Roasted Veggie Balsamic Chicken Grain Bowls – an easy meal prep recipe with 28 grams of protein and less than 350 calories a serving! 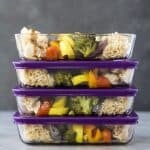 Gluten Free Roasted Veggie Balsamic Chicken Grain Bowls – an easy meal prep recipe or weeknight dinner for the week. Loads of veggies, light, flavorful, easy to make with 28 grams of protein and less than 350 calories a serving! Sometimes I literally feel like I can’t think until I have a cup of coffee. Well, maybe I can think. But my mind doesn’t stay focused on the task at hand. It’s almost like I have A.D.D. Mike and I have a list in Evernote (which is a task list app) that has all of the items we want to get to “finish” off the house. We’ve had the same dinnerware for probably 4 years and the same flatware for at least 10 years. It’s time for a new set. I think I realized that more than ever the other night. We had some friends over for dinner and I was serving up my 15 minute Filet Mignon that I made. I grabbed one plate, put the steak on it and topped it with a homemade compound herb butter. Then grabbed the next one and did the same thing. I grabbed another plate and when I was getting ready to put the steak on it I realized I only had half a plate!! The other half was still on the counter. No crash, bang or breaking noise. I just picked up the plate and the other half didn’t come with it. Needless to say it’s time to get new dinnerware. Target brand you’ve served us well, but it’s time to upgrade! Speaking of upgrade. 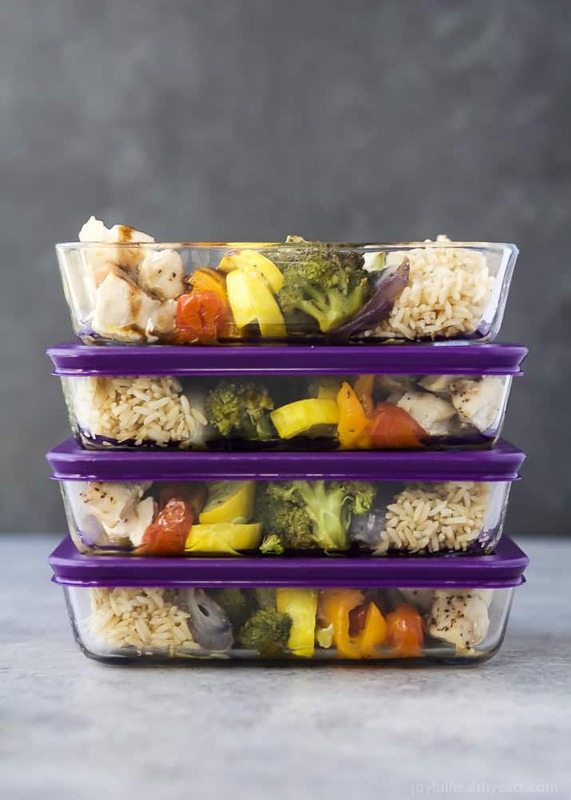 Since I upgraded my tupperware to this Pyrex glass containers I’ve found myself making more meal prep recipes. Not only is it nice to have meals already made in the refrigerator. But they just look pretty stacked. 🙂 It’s the simple things in life lately. I hope you’ve been enjoying the meal prep recipes as much as I’ve enjoyed making them! 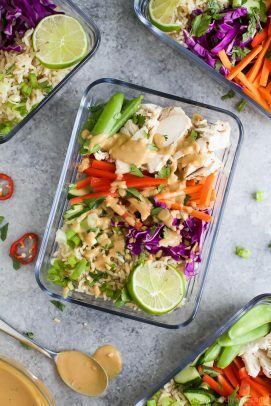 Have you tried the Thai Chicken Grain Bowl with Peanut Dressing yet? If not, get to it! Then make these Roasted Veggie Balsamic Chicken Grain Bowls. Not only does the bowl look like you’re eating the rainbow with all the veggies. But everything is made on one pan with minimal ingredients, thrown in the oven and then cooked together. Then all you have to do is portion out the rice, veggies and chicken. I made a light balsamic dressing for this as well and instead of marinading everything in the dressing, I decided to keep it on the side. That way when you warm everything up to eat it, you can top it with the dressing and revive the dish so it’s not dry. It’s absolutely perfect and filled with simple, fresh and light flavors! I know you’re going to love it! 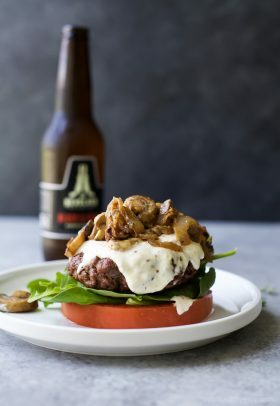 Don’t want to use this as meal prep dish for the week? It also makes a great quick weeknight dinner! And is one of the best ways to get your kids to eat veggies. 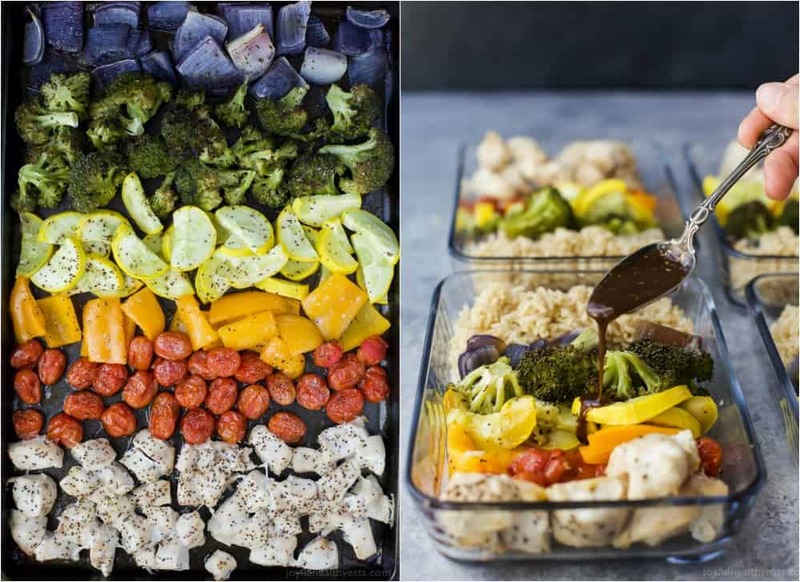 They can help you put the veggies on the baking sheet to make it look like a rainbow and will have more fun eating them. Cason wasn’t a fan of broccoli before, but roasted and dipped in a balsamic dressing he was definitely more ok with it than ever before. Which is saying something! He even ate the red onions! Bon Appetit friends and happy almost FEBRUARY! AHHH!! 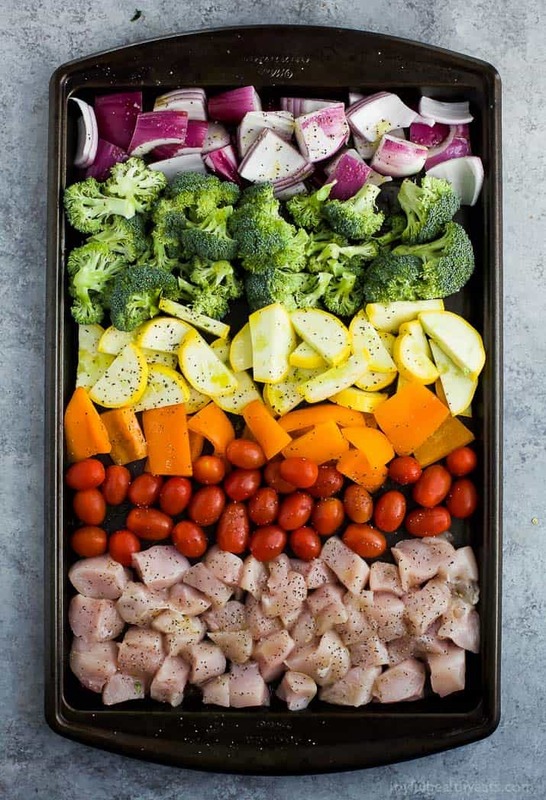 To a baking sheet add the following in rows: cubed chicken breast, cherry tomatoes, orange bell pepper, yellow squash, broccoli florets, quartered red onion. Drizzle with olive oil and season with salt and pepper. Bake for 25-30 minutes until chicken is no longer pink. Remove from oven and let sit. To a small bowl add dijon mustard, honey, balsamic vinegar, garlic powder, basil, salt and pepper. Whisk to combine. Slowly add in the olive oil and whisk until the dressing starts to thicken. 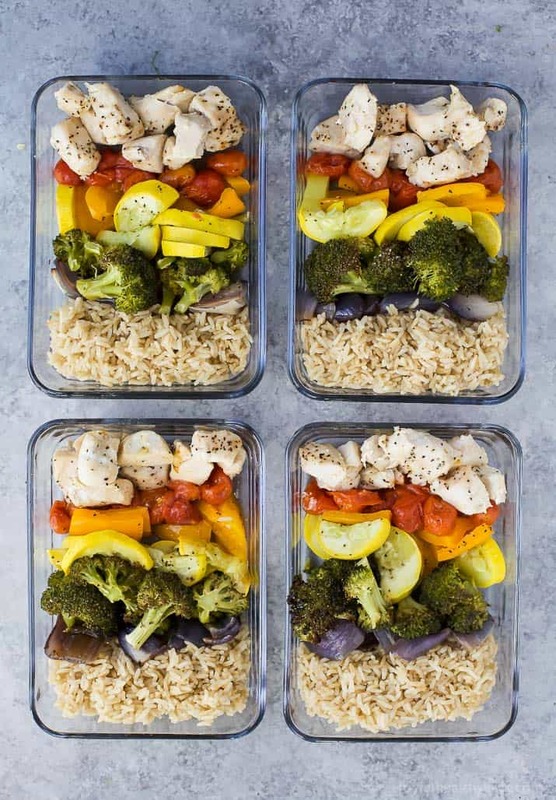 Assemble 4 meal prep bowls: add 1/2 cup cooked brown rice to each bowl, evenly distribute the roasted veggies and chicken to each bowl. 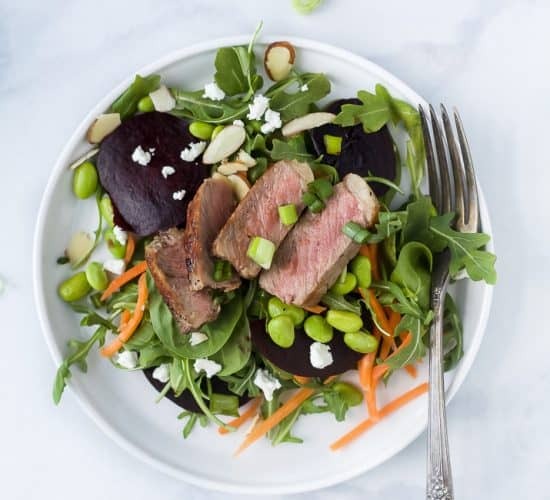 When ready to eat top with a drizzle of the balsamic dressing. Want More Quick & Easy Recipes? These bowls sound SO good. 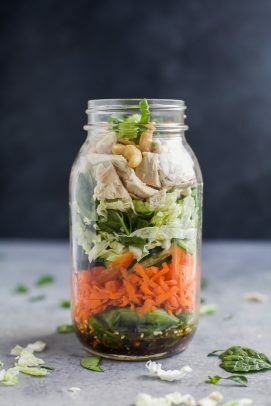 I’m totally in need of all the make ahead and easy things I find, so definitely adding this to my meal plan! I’m with ya girl. Babies don’t leave you with a lot of extra time! Hope you and the hubs enjoy! Wow, this lunch looks like it really will give you the energy to power through the day! Love it!! I’m going to make this for my husband’s lunches next week. Such a smart way to stay on track and be prepped. I am living everything about this! All of those glorious roasted veggies! 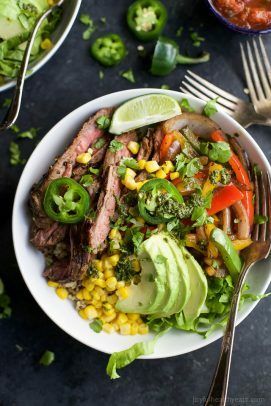 That grain bowl is the perfect meal prep dish! 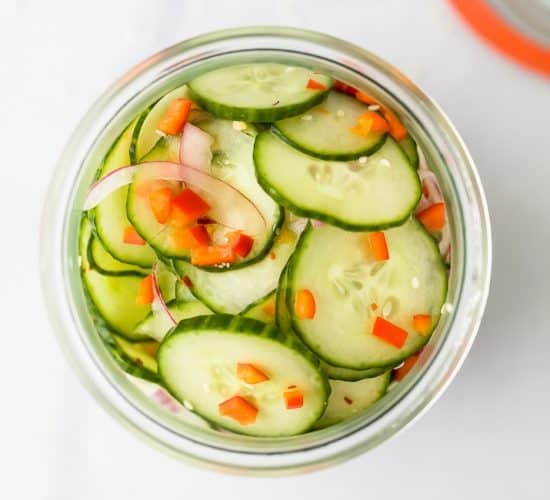 These would be perfect for lunches during the week! Love the colors! This is my kind of meal!! Perfect for lunch or dinner!! I LOVE IT! 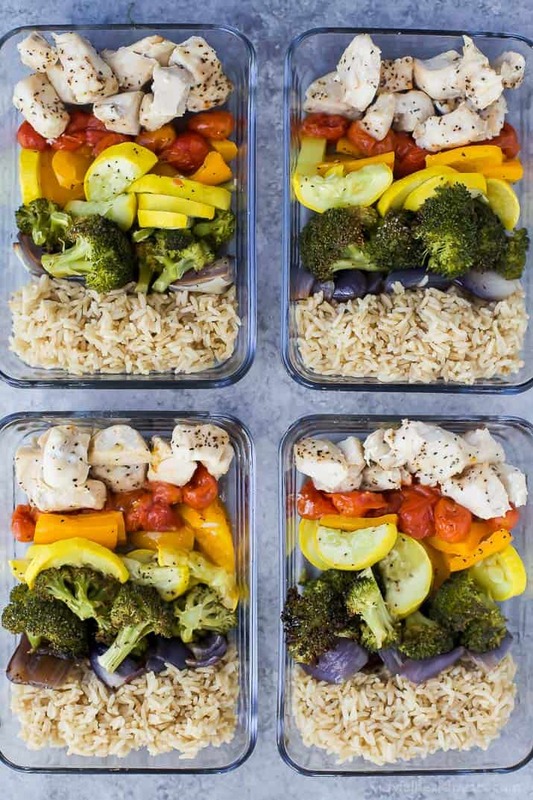 What a great meal prep idea! I am loving all the colors in this dish. Now I know what will be my next meal! Looks so delicious! These look absolutely perfect! I love balsamic veggies!